1953: Grandmaster Lee Tae Sung started training Taekwondo in Incheon Korea with a military squad that allowed civilians to join in. . He, along with ATA President LEE Haeng Ung, were students of Grand Master KANG Suh Chong in Incheon. Grand Master Kang was head taekwondo instructor of the ROK Navy's Underwater Demolition Team (UDT) which was located in Incheon, and he also had a dojang there. Grand Master LEE Haeng Ung and Grand Master LEE Tae Sung both studied under Grand Master Kang. 1955: He received 1st Dan, and was invited to train at the Chung Do Kwan headquarters in Seoul, where he was groomed to become an instructor. 1957-1965: Grandmaster Lee was deployed to Osan Korea, to be one of the instructors at the US Air Force base. In 1964 Grandmaster Twing became his student here. During this time, he was required to report to the Chung Do Kwan headquarters in Seoul for continued training. Great Grandmaster Lee Won Kuk, (Chung Do Kwan founder) would attend several weekend training camps a year for instructor training at the Chung Do Kwan headquarters. However, Grandmaster Lee said that President Um Won Kyu was most influential in his personal Taekwondo style and the style of most Chung Do Kwan instructors of his generation. 1966-1968: Grandmaster Lee taught the Kyun Gi Police Force, as well as taking an active role in teaching at the Chung Do Kwan headquarters in Seoul. 1968-1978: President Um Won Kyu named Grandmaster Lee “Head Instructor” along with Grandmaster Park Hae Man for the Chung Do Kwan headquarters. This is a title he still retains today. Grandmaster Lee said he did much of the teaching during this time, because Grandmaster Park was assigned to the “Blue House” (Korea’s White House) as a Taekwondo instructor for the secret police. 1979-1986: Grandmaster Lee was sent to teach Taekwondo in Saudi Arabia, at the University of Petroleum and Minerals. During this time he spent 9 months out of the year in Saudi Arabia. 1986-Present: Grandmaster Lee was reunited with Grandmaster Twing and became the Blue Wave’s Grandmaster Instructor. He continues to work for the Chung Do Kwan headquarters in Seoul as an instructor, as well as administratively. 1961 Bruce Twing is introduced to the martial art of Judo while serving in the Air Force in Glasgow Montana. 1964 Bruce Twing went to Osan Air Force Base in Korea where in thirteen months he studied Taekwondo under 3rd Dan black belt Mr. Tae Sung Lee. 1965 He earns a 1st degree black belt and soon after leaves Korea. 1969 Bruce Twing opened a dojang in Hardwick Vermont, named Vermont Academy of Karate. He started with 14 students; his first student was Ellen Pape. 1970 Master Twing closes the Hardwick dojang and opens one in downtown Barre Vt.
1970’s Mr. Twing had lost all contact with his instructor Master Tae Sung Lee after he left Korea. 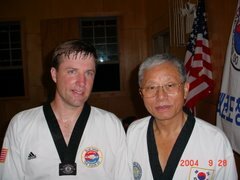 He was able to make contact and subsequently tests up to 4th Dan under 6th Dan Master Myung Kil Kim who had been an instructor at Osan Air Base. Master Kim had been brought to the U.S. (Indiana) under the sponsorship of Master Edward Sells and Dennis Callahan. He only ‘visited’ the Vermont Dojang intermittently. He was an ITF style master and therefore the Barre dojang was an ITF school. Master Kim was known as a gangster who enjoyed causing confrontation. Neither Kukkiwon nor Chung Do Kwan certifications were being issued. Some of the prominent students were Mr. Robert Decker, Mr. Joe Donnely, Everett Ainworth, Michael Ainsworth (famous for spear finger breaks through 3 boards), Audrey Andrews Pudva and Ellen Pape. 1974 Mr. Twing moves to Atlanta Georgia closing the Barre dojang. Mr. Decker opens a dojang in Newport Vermont. Mr. Twing teaches TKD in Georgia at ‘churches and community centers.’ He does occasionally visit Vermont. Master Kim died of cancer during this period. 1978 Mr. Twing moves to Enosburg Falls Vermont. He travels regularly to Mr. Deckers Newport dojang to instruct. Linda Smith-Blais joins the Newport Dojang. At this time there was an association of dojangs with Mr. James Glenn in Nashua, N.H., Mr. Jay Girouard in Ludlow Vt., Mr. Robert Decker in Newport Vt., Mr. Joe Donnelly in Burlington Vt. and Dale Michard in Barre Vt.
1980 4th Dan Master Twing forms the Blue Wave Association with 3rd Dan Mr. Robert Decker. 1982 Master Twing temporarily moved to Atlanta Georgia once again. 1983 Master Twing moved to Chelsea Vermont. During the early 1980’s all testings were held in the Dojang. There were no quarterly testings, and the handful of association black belts found themselves traveling quite often to the several Dojangs. A typical testing had less than ten black belts in attendance. Breaking and Poomse requirements were very strict. All poomse performed until the testing board was satisfied, and all boards had to be broken. The first Blue Wave Summer Camp was held at Lake Willoughby in Westmore Vermont. In October Master Twing opened the Randolph Vt. dojang. He instantly had a large class of about 25 white belts which grew to as much as 50 in the line up by the next year. Randy Rotta, Kurt King, Keith Wescott, Tom Chase and Peter Chase are early students. 1986 April 5, Master Twing takes several students to Dayton Ohio to compete in the 12th USTU nationals. At this tournament he finds that Master Lee is teaching in Saudi Arabia. He mails him a letter telling him of the Blue Wave. In May Master Twing answers the phone and hears “Twing, this is Mr. Tae Sung Lee.” He speaks with Master Lee for the first time in over twenty years. June 15, Master Twing and six students travel to Korea where Grand Master Tae Sung Lee was re-united with Master Twing. At this time there were dojangs in St. Albans Vt, (James Plante) Newport Vt. (Robert Decker), St. Johnsbury Vt. (Richard Menard), Sanford Maine (Dennis Morin), Randolph Vt. (Bruce Twing), Burlington Vt. (Richard Dunleavy) and one in Canada (Benoit Guay). Soon after Mrs. Cynthia Morin, Ms. Celeste Bovin and Mr. Caouette opened additional Maine dojangs (Shapleigh and Alfred in addition to the Sanford dojang). Master Twing was soon promoted to 5th Dan Kukkiwon, Master Rank in October. Master Lee lived in Vermont for several months and instructed many classes in Randolph. 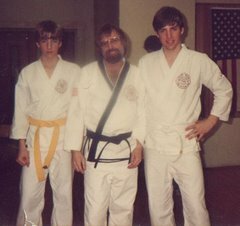 In the fall, 2nd Dan Delbert Reed opened a dojang in East Haven. 1st Dan Mr. Gordon White joins the association after attending Lake Willoughby summer camp as a guest. 1987 February a group of association members travel to Korea and test at Kukkiwon. 2nd Dan Mr. Gordon White opens a dojang in Williston and then later on in Essex Vt. Tim Warren was a student at the Essex dojang. Master Lee and Master Hae Man Park attend Summer Camp at Lake Willoughby. The changes in the Blue Wave association were unacceptable for some; Master Robert Decker and several dojangs split the Blue Wave but retained the Blue Wave name in the form of Blue Wave International and switched back to the ITF system. Newport, Burlington and St. Albans split from Master Twing. Randoph, East Haven, Essex Jct, St. Johnsbury and the Maine dojangs remain. 1988 Summer Camp started at Emerson Falls St. Johnsbury. 3rd Dan Mr. Broduer opened a dojang in Woodville with the help of Miss Cathy Bisson. Mr. Tinkham and Mr. Whitcher were some of the early students. 7th Dan Master Twing takes several students to Korea to train with Grand Master Lee. 1989 Master Twing resigned as head instructor of the Randolph Dojang and 2nd Dan Randy Rotta assumed the duties of head instructor. Master Twing wanted to devote his time to association president duties. He still visited and instructed in Randolph quite often. Late in 1989 Association 2nd Vice President Mr. Dennis Morin 4th Dan Instructor of the Sanford dojang moved west leaving instruction to 2nd Dan Miss Peggy Feyler. 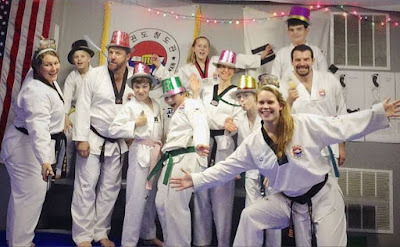 Ms. Celeste Bovin closes her dojang in Maine. Master Lee lived in Maine for about a year and instructed at several Dojangs. 1989 3rd Dan Miss Linda Smith opens a Dojang with Mr. Larry Blais in West Lebanon NH. 1st Dan Mr. Paul Theriault opens a dojang in Bradford Vt. Summer camp get heavy rains. 1990 Summer camp testing begins as a Sunday event. Summer camp activities include the talent-less show. 4th Dan Mr. Michael Anthony joins the Blue Wave with his Beverly Massachusetts dojang. 1st Dan Mr. Kurt King opened a dojang in Berlin. 1st Dan Mr. Tim Warren opened a Dojang in Milton 1st Dan Mr. Chase opened a dojang at VTC. 1991 Mr. White closes the Essex dojang and goes to Korea to train with Grand Master Lee. Mr. Anastasi and Mr. Trafton join him six months later. 3rd Dan Delbert Reed Closes the East Haven dojang. Summer Camp gets heavy rains, and the camp is held indoors. Winter Conference held in Wells Maine. 1993 Summer Camp Moved to Tunbridge Fairgrounds. Connecticut CDK attends summer camp for the first time. 1st Dan Mr. Anastasi opens a dojang in Danvers Mass. Master Twing coaches Gordon White first at the US Nationals (placing 3rd) then at 93 US Team Trials taking a silver medal. Mr. White attended the 1993 World Games in the Netherlands. This is the first time a Blue Wave member qualified for the US Team and competed in a sanctioned WTF international event. In the summer of 1993 the Randolph dojang run by 3rd Dan Randy Rotta left the association. Ms Milly Rhoades leaves Randolph and joins the Lebanon dojang. 1994 4th Dan Mr. Brodeur opened a dojang in Littleton NH. 2nd Dan Mr. Russell Tinkham and Mr. Whitcher took over the dojang in Woodsville. Mr. Chase closed the VTC dojang. Mr. Brodeur soon had move out of the area and closed the Littleton dojang. Quarterly testing changes were needed because the attendance level of these meetings had dropped to very disappointing levels. The format was changed to a one day event, with the black belt meeting shortened to the morning with the testing immediately following. The Quarterly Location was changed from hosting at various locations, to a central location, usually the Elks Club in Lebanon N.H. Mr. Anthony Hodgdon becomes instructor to the Franklin NH dojang. 3rd Dan Mrs. Jean DelPorte joins the Blue Wave in Lebanon. The current rule was approved at the May 1994 meeting which requires attendance to a majority of the quarterlies to qualify for promotion. Later that year 3rd Dan Ms. Feyler (Sanford Maine dojang) left the association and 2nd Dan Miss Heidi MaHoney took over as instructor of the dojang. 1995 2nd Dan Mr. Anastasi closes the Danvers dojang. 3rd Dan Tom Chase opened a dojang in Bethel. Summer camp main event is the obstacle course. In November Association 1st Vice President Mr. Richard Menard 4th Dan instructor of the St. Johnsbury dojang left the association and joined the Grand Master Sells association. We lost Mr. Tom Robinson among many other prominent black belts. This was one of the larger dojangs in the association. 1996 The association promoted two of its members to 5th Dan. (Master Anthony and Master Blais). 1st Dan Mr. Dawson Geoffrey opens a dojang in West Fairlee Vt. 1st Dan Ms. Karen Kristiansen and 1st Dan Mr. Moore open a dojang in St. Johnsbury and then moves to East Haven when Mr. Reed re-opens a year later. Summer Camp results in several pranks. 1997 Master Twing is co-host of the World Chung Do Kwan Championships in Washington DC. A large contingent of the association charters a bus and attends. Many get to meet Great Grand Master Won Kuk Lee in a seminar. 4th Dan Mr. Delbert Reed Reopens the East Haven dojang with 2nd Dan Ms. Karen Kristiansen. 4th Dan Mr. Paul Tereault, Instructor of the Bradford Vt dojang left the association leaving 2nd Dan Mr. Chip Ulery to take over as head instructor. 3rd Dan Mr. Kurt King closed his Berlin dojang leaving 2nd Dan Mr. Jon Joslin as the instructor. Mr. Geoffrey closes the West Fairlee dojang. 3rd Dan Mr. Tom Robinson rejoins the association and is Re-elected Treasurer. The infamous plastic wrapping incident occurs at Summer Camp. Master Blais retires as Head Instructor of the Lebanon Dojang, and 2nd Dan Mr. Larry Lepenven becomes instructor. http://www.bluewavetkd.com/ begins. 1998 The association Newsletter starts being published again. In August Master Twing was diagnosed with lung Cancer and began chemotherapy soon after. Due to the treatments and declining heath, Master Twing resigned as association president and 4th Dan Mr. Gordon White was voted as acting association president. 1999 Mr. Warren due to a severe automobile accident resigned as instructor of the Milton dojang. 1st Dan Mr. Ken Robie took over as Milton instructor. 4th Dan Mr. Delbert Reed retires as head instructor of the East Haven dojang, 2nd Dan Mr. Steven Gadapee becomes head instructor. Summer Camp 1999 was not held for the first time since it began in 1983. July: Several students went to Korea with a very ill Master Twing for training and testing. Mr. Gordon White was promoted to 5th Dan (Master), and several others tested for their next rank at Kukkiwon. Master Twing is promoted to 8th Dan ChungDoKwan. Grand Master Bruce V. Twing died in August 1999. 2000 We saw the creation of two association wide events called Winter Camp, and the annual Bruce V. Twing Memorial Juniors tournament. Winter Camp Saturday night entertainment features the Milton Dojang performing in full cheerleader regalia. In June during an association Black Belt workout, Mr. Rathbun tears his Achilles tendon which is the reason for the name of the annual June RAW association event. (Rathbun Achilles Workout). Paddleball is the summer camp craze and cheerleader posters are hung as a prank. October; odd number Gup rank belts change to a full stripe through the middle of the belt. Much of the Beverly dojang travels to Korea to train with Master Lee. Master White opened a dojang in Burlington Vermont. Mrs. Jean DelPorte took over as head instructor of the Lebanon dojang. Mr. King reopened a dojang in central Vermont. 3rd Dan Mr. Anastasi opens a dojang in Ipswich Mass. Mr. Anthony Hodgdon closes the Concord dojang. 2001 Mr. Ulery stopped instructing and training in Bradford and 2nd Dan Mr. Kline took over as the head instructor. RAW in Maine. 3rd Dan Mr. Joslin closes his Montpelier dojang. Summer Camp Paddleball craze intensifies and jock rock sound is added to the event. Cribbage tournament also begins. 2002 Testing procedure change came around again. Quarterly testings would become regional and test candidates up to 1st gup red belt. Summer Camp and Winter Camp would become Bi-Annual black belt testings. In March Mr. Robie closed the Milton Dojang and combined with Burlington. Mr. Anastasi closes the Ipswich dojang bringing students with him to rejoin the Beverly dojang. Mr. Guy Brochu with the help of Mr. John Brochu took over as head instructor of the Woodsville dojang. Master Blais and Master DelPorte begin teaching the Dartmouth College dojang. RAW in Maine. Summer camp Paddleball craze ends due to numerous injuries to body and pride. Slip & Slide at summer camp is added as a feature entertainment attraction. 2003 Ms. Tara Rebele opened a dojang in Athens Georgia. Jean DelPorte moves the Lebanon (Elks Club) dojang to Hanover. Summer camp events include both a wedding and the Blue Wave Olympics. September 2003 six tested at a special testing for the rank of 5th Dan (Master Rank) Tom Chase closes the Bethel dojang and opens a new one in Randolph. 2004 Winter Camp Mr. Kline’s car is covered with cheese whiz, diapers and doughnuts. No culprit is caught. Master Blais completes the new black belt goal sheets. Master Warren works on standardizing one-steps. Summer Camp prank is the re-display of the 2000 Cheerleader Posters. Mr. Brochu’s ten-seater bicycle is broken. 3rd dans unite and the camp theme is that 3rd dans rule. Masters Of The Universe (MOTU) dispute this. RAW in Bradford. Mr. Gadapee is called up for military duty and Mr. Ryan McCue becomes the East Haven instructor with Master Tom Robinson as the Master Instructor. October Black Belt meeting and workout with Master Lee; plans are made to create a weekend event ‘Black Belt Conference’ to be held in the first weekend in November of next year. October, Master Lee instructs at several dojangs. Blue Wave Forums begin (Internet web site for open discussion of various topics). 2005 January Black Belt meeting and workout at Dartmouth. Kibon documentation begins. Policy and Procedure is revised. Winter Camp in Wells Maine. The 3rd Dan rules craze continues. MOTU organize in response. RAW (spear training) in Wells Maine. Ms. Tara Rebele closes the dojang in Athens Georgia. Mr. Peter Monty Jr. opens a dojang in Hinesburg Vt. Mr. Tinkham re-opens a Groton Vermont Dojang. The Barre Vt. Dojang closes. Mr. Mike Masure begins a school program in the Northeast Kingdom. Master Lee attends summer camp in Tunbridge Vt.
January Black Belt meeting and workout in new Bradford dojang. March Winter Camp with Master Lee in Wells Maine. Juniors day competitors over 100 again. Summer Camp Tunbridge. Mr. Anton Working on re-writing Student Manual. 2nd Annual Black Belt Conference held in Ascutney Vermont. Blue Wave Festival held at Dartmouth College, Hanover NH in December. 2007 Wintercamp in Wells Maine. Mr. McCue steps down as instructor of the East Haven Dojang, and Master Delbert Reed takes over as head instructor. BVT Juniors tournament venue moved to Vermont Technical College in Randolph Vermont with 120 competitors. Summer Camp in Tunbridge features dodgeball. In between seminars we had a momentary lapse in reason -- a single match of paddleball occurs......(probably will not happen again!) 3rd Annual Black Belt Conference moved back to Killington Vt. September: Special high rank testing in Hanover NH. Juniors tournament moved to December and held at VTC again. NING replaces the old forums as our way of communicating on the internet. 2008 No Juniors tournament this year. Winter Camp held at a different venue for the first time. Manchester New Hampshire. GM Lee in attendance. The new location was done for more workout space. 27 test on Friday night. No Juniors tournament this year. 25th annual Summer Camp in Tunbridge, some rain, but not too bad. 4th Annual Black Belt Conferance at Killington Vt.
2009 10th Winter Camp in Manchester New Hampshire. GM Lee in attendance. 33 test on Friday night, of which 7 test for 5th dan or higher including Master Anthony and Master Blais testing for 7th Dan. 10th Bruce V. Twing Memorial tournament at VTC in May. Summer Camp at Tunbridge Fair Grounds. Black Belt conference at Killington. Golf fund raiser in Bradford. Mr. Kitonis opens a new Dojang in Portland Maine. 2010 Winter Camp in Burlington Vermont. GM Lee in attendance. Black belt conference in Wells Maine. Master Kline steps down from the role of head instructor in Bradford, and Mr. Elliot has taken on that role. Golf fund raiser in Bradford. Lightning Strikes the Bradford Dojang and the resulting fire forces them to relocate for several months. Golf fund raiser in Bradford. 2011 Winter Camp in Burlington Black belt conference cancelled and a workout in Bradford for one day replaces it. 2012 Winter Camp in Burlington. Mr. Barlow opens a Dojang in Sheffield. Sanford Dojang closes. Grandmaster Lee, Tae Sung. (1934-2012) 9th Dan. Passes away after a battle with cancer. He had been head Instructor of the Chung Do Kwan since 1968. 2014 Winter Camp in Burlington. Master Kline steps down as head instructor of the Bradford Dojang. The Tom Elliott and Sandy Elliot take over. 2015 Winter Camp in Burlington. Master Reed moves the New Haven Dojang to Lydonville and soon after steps down as head instructor of the . Mr. Barlow takes over as head instr. Randolph Blue Wave started in October of 1983 by Master Bruce V. Twing. My name is Tom Chase, I run the Blue Wave Taekwondo School in Randolph Vermont. We are a Kukkiwon Taekwondo (WTF Style) School, with Chung Do Kwan heritage. I will be putting notes, pictures and other information in this blog to provide information to my Dojang and the rest of the Blue Wave.